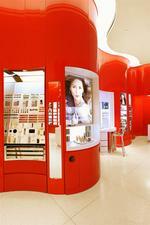 Red is the corporate color for this cosmetic and fragrance company. 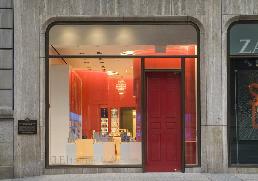 A curving red wall is the bold architectural statement of this flagship store. 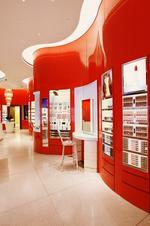 The curving red wall is lit with a curving back lit ceiling cavity. To ensure merchandise and people do not appear red, the cavity width was critical to ensure direct white light. A large scale media wall displays merchandise and ad campaigns, and the rear panels of the merchandise shelves are back lit with LED's to create color change and kinetic movement to coordinate with the ad campaigns.